How do I Merge Users? I have duplicate users in my system. How should I handle this? Beneath the Users-->Merge Users tab, you can merge duplicate users (for example, if a user has an email alias in the console). 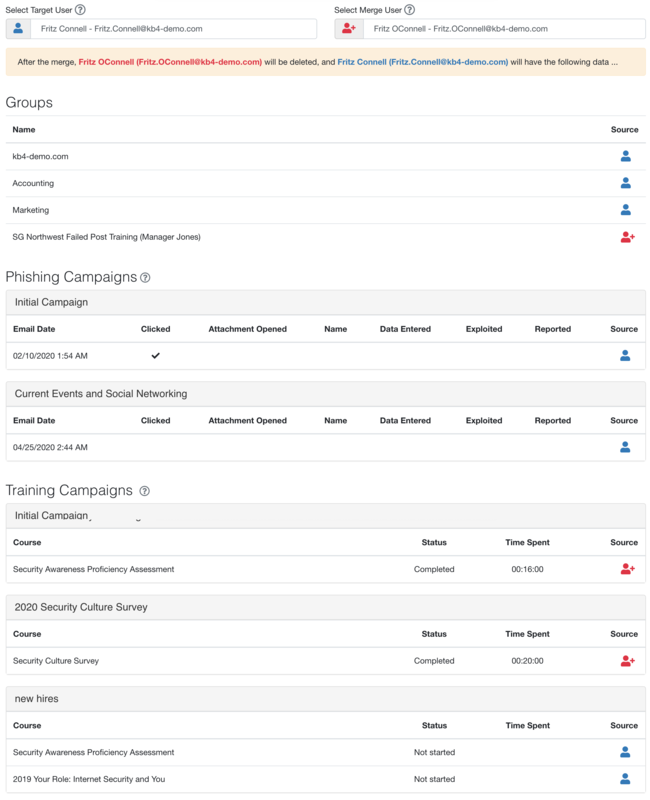 This option will retain phishing and training-related data from the secondary user if it is found to take precedence over the primary user's data. Log into your console and click on the Users tab at the top of your screen. 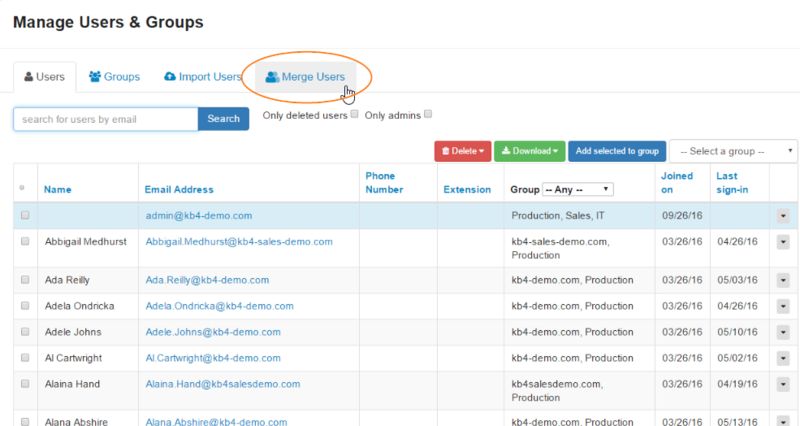 Click the Merge Users tab to select which users you'd like to merge. Select your Target User. This is the user whose email address you'd like to keep in the console. Then select your Merge User. This user will be deleted from the console once the merge is completed. Once both users are selected, review the data that appears. This will show you which data will be retained/combined about each user. If both users are present in a Phishing campaign, whichever user did the worst (such as clicked, opened attachments, or other phishing test failures) will have their data retained. If only one user is present in a Phishing campaign, then the data will be retained, regardless of whether it is the target user or the merge user. If both users are present in a Training campaign, whichever user made the most progress on the campaign will have their data retained. If only one user is present in a Training campaign, then the data will be retained, regardless of whether it is the target user or the merge user. If the user you are merging is an administrator and the target user is not, the admin privileges will be lost upon completing the merge. If you're a Platinum or Diamond customer and you have Security Roles in place, the merged user will assume the rights of the target user after the merge is complete. If everything looks good, click the Merge Users button at the bottom of the screen. Remember, you cannot "un-merge" users, so double check to make sure the correct action is being taken.